The massive job cuts announced by General Motors have been the talk of the financial media since they were announced on Monday. Not only did the news trigger a buying frenzy of GM stock among trading desks, it also quickly made its way to the factory floors at places like Northeast Ohio, as workers found themselves trying to assess the coming impact of the decision. 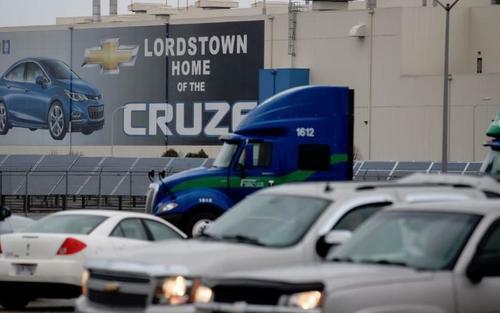 The termination of 1,600 workers and the shuttering of Cruze production at GM's Lordstown plant has already resulted in profound aftershocks. The WSJ highlighted several such stories, like Sylvester Townsend, whose company makes front and rear bumpers for the ill-fated car in nearby Youngstown. He stated that he may need to lay off all of his 32 production workers as a result of the GM decision. "It blew me away. It’s going to be devastating," he said. The mayor of Lordstown has anticipated that the cuts are going to cost $1 million in annual tax revenue, which is about 25% of the town's total budget. He is holding onto the slim hope that the plant may reopen at some point. Mayor Arno Hill stated: "They didn’t say they were permanently shuttering the plant. So we figure that we still have a heartbeat." And, as Trump's latest tweets confirm, the president is doing everything in his power to make sure the mayor's hopes come true. Until then, however, the Lordstown shut down is part of a larger cost-cutting initiative by General Motors to shed its slower-selling and lower-margin product lines. Among other things, GM announced on Monday that it plans to end production at additional assembly plants in Michigan and in Canada, which could contribute to up to 6,700 total factory workers being laid off. The company also was planning to cut another 8,100 salaried workers in North America, many of whom are working currently in product development. GM is planning to use the billions in cost savings to help it navigate further into electric and autonomous vehicles. The company also announced it would stop producing the Chevrolet Volt hybrid, the Cadillac CT6 and the Buick LaCrosse. Justifying her decision, on Monday GM CEO Mary Barra said that "we recognize the need to stay in front of changing market conditions and customer preferences to position our company for long-term success." The Lordstown plant had already seen its workload cut last year when it moved from three shifts to two – and then in June of this year, down to one. Christina Defelice, who was laid off from GM in June, passed the news on to her husband who was working at the plant when it broke on Monday. Her husband wound up returning to work after hearing that the plant will close next March – with some of his coworkers reportedly in tears. Their family may need to leave the area if they are unable to find work, she told the Wall Street Journal. She stated: "I’m crushed, and I’m foreseeing a bunch of hardship in the next couple of weeks with the rest of my co-workers." The closure of this plant would be another step in the deindustrialization of the area between Pittsburgh and Cleveland. This area saw many of its jobs go up in flames during the steel bankruptcies of the 1980s. And since these shutdowns were the exact opposite of what President Trump had promised during the his campaign, his criticism of GM over the past 24 hours has been furious. Trump, who said he spoke with CEO Mary Barra on Sunday night and who said that he does not like's GM's decision on North American auto production, said that GM needs to find a replacement for the Chevy Cruze, which isn’t selling, and said he expects that GM will put something else in Ohio. "We have a lot of pressure on them,” Trump told reporters as he left the White House for Mississippi. Trump also said that he told GM to stop making cars in China, and that he told GM "they better get back in there soon." The Lordstown plant opened in 1966 and used to employ as many as 20,000 workers in the 1980s.